A few days of 50+ degree weather and I'm feelin' Spring in the air. What better way to celebrate than by making (and consuming) cupcakes. 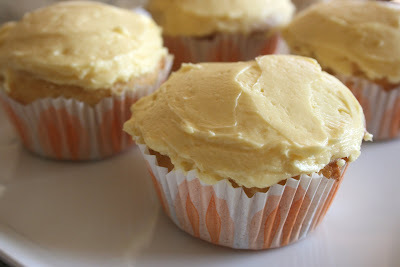 First, I made these vanilla cupcakes with a passionfruit buttercream I pretty much made up as I went. I loved the competition between flavors on this cupcake. I baked the cupcakes in these pretty little cups I bought last year from here. Afterwards, I placed one cupcake in a little Chinese takeout box, attached an initialed tag, and then dropped off the little packages on nearby doorsteps. What gal couldn't use a cupcake at the end of the day? I know I could use one...or two...or a dozen. Locally, you can buy fantastic containers/boxes for this kind of thing at Xpedx on 33rd and State. I gathered momentum and a week later decided to make some Magnolia Bakery cupcakes--the vanilla vanilla to be precise. I preferred this recipe slightly over the above recipe. The Magnolia vanilla buttercream frosting recipe was excellent but I opted to include too little powdered sugar. Next time I'll follow the recipe a little closer and I'm sure the result will be a more firm buttercream--just like the ones at Magnolia. I love buttercream. What a nice treat! Oh how I miss xpedx! 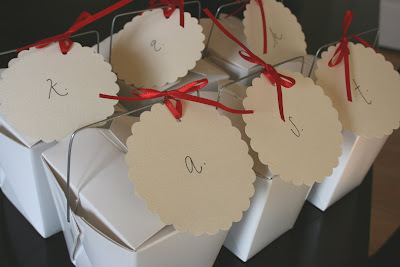 I love using takeout boxes for the packaging of goodies and since becoming more popular there are some cute choices out there. wow. I wish I were your neighbor. I need to start making cupcakes. they're such a perfect treat.